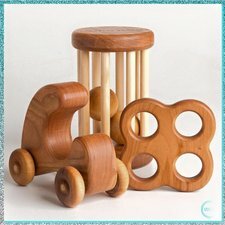 Shoppers go gaga over handcrafted wooden toys, remembering the hours of playtime pleasure they enjoyed way back when. 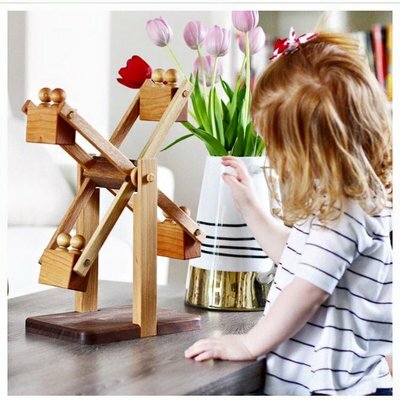 A Summer Afternoon offers a host of natural wooden toys made from top quality hardwoods that are elegantly simple in design with oodles of play value. A Summer Afternoon is a family affair helmed by the Nuland family with “assistance” from five — count ‘em — sons as well as Erin’s Dad and a nephew who drop in to lend a hand when orders pile up. 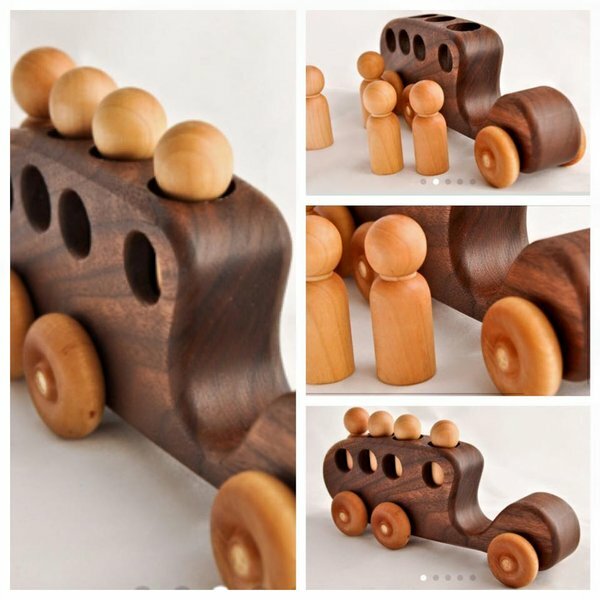 Among the developmental toy goodies is the walnut truck (available in other hardwoods) that provides lots of fun while promoting fine and gross motor skills and encouraging the development of hand-eye coordination. Kids love stacking the pieces and dragging the truck around the house and no one need worry about splinters as all edges are smooth as silk and the whole finished with a natural beeswax finish. A simply designed, walnut bus that is also available in cherry or maple comes with four passengers. It’s the kind of toy that lasts and also makes a cool addition to the décor of a child’s room. Those seeking a “first” car for a youngster who isn’t yet quite old enough for the real thing, the tow truck is perfection on wheels. Eleven inches long, and made from beautiful walnut hardwood, it’s sturdy and strong and can tow any of the company’s other vehicles. 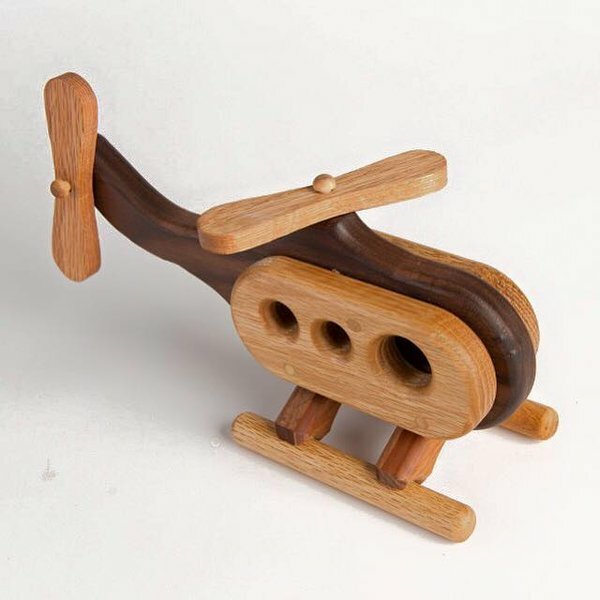 The cherry wood clacker rattle makes an outstanding baby or shower present. The teething ring is shaped so babies can grasp it as soon as their little hands acquire this skill; once they get hold, they chew happily for hours. 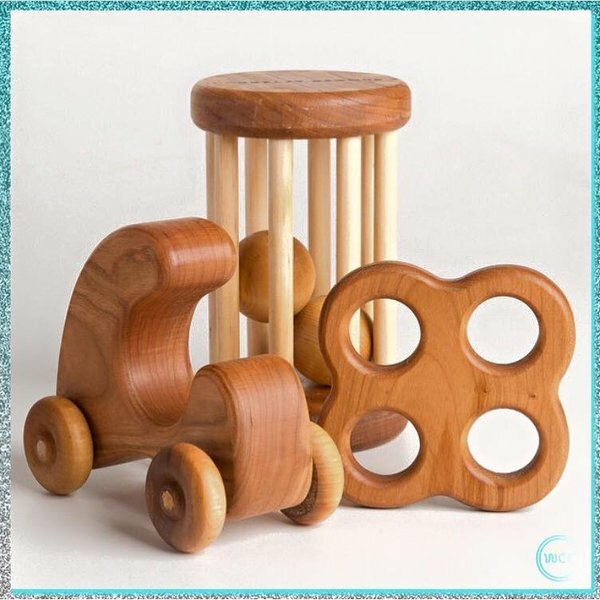 The clacker rattle has the added fun of a soft noise for additional stimulation while the abstract car on little wheels says a cheery “welcome” to a baby boy. 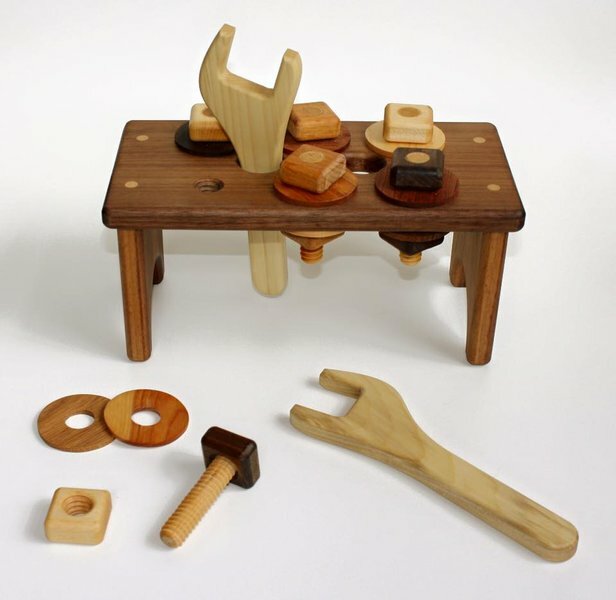 For kids aged five and up, the 45-piece hardwood building blocks set makes a super present providing budding architects — or just plain boys and girls — with a great outlet for creativity. Block sizes range from .5”x1.5”x1.5” or 3/4”x3/4”x3” for the smaller shapes to larger pieces in the 1.5”x1.5”x4.5” or 3/4”x1.5”x9” range. An ample number of arches and triangles is part of the deal and each set is hand-crafted , sanded to smoothness and finished with a totally non-toxic, food-safe, beeswax and mineral oil finish. 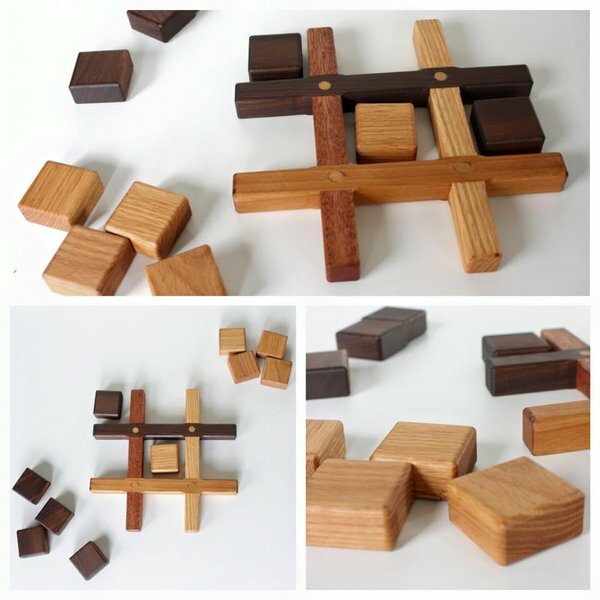 As a bonus, each of these hardworking block sets comes with a good-looking hardwood box to hold the blocks — fitting them in is like completing a puzzle so it’s a double-whammy great toy.